While regulations are necessary to maintain order and to ensure implementation of public policy, North Carolina citizens and businesses faced a deluge of more than 15,000 state agency regulations placed on them over the decade leading up to the 2011 legislative session. This represented an average of more than four new rules every day! The chaos and uncertainty of a constantly changing playing field undermined the certainty that companies needed to plan and invest in the future. Eliminating or modifying unnecessary or overly burdensome regulations is necessary to increase corporate profits and jobs because regulations are costly to businesses. Unfortunately, many dismissed the idea of regulatory reform, because it seemed like an example of businesses seeking profit at the expense of everyone else. The truth is that excessive regulation hurts everyone. Regulatory reform was long overdue in North Carolina when the Republicans made it a platform issue and took over the majority in the House and Senate in the 2010 elections. The business community strongly supported regulatory reform and formed a coalition, led by Lisa Martin, that worked with legislative leadership to put together the first comprehensive regulatory reform effort in at least 20 years. The resulting legislation, which became Senate Bill 781, clarified and simplified some of North Carolina’s confusing and outdated regulations, making it easier for citizens and businesses to attain permits and rely on more predictable guidelines. The bill included multiple amendments to the North Carolina Administrative Procedures Act (APA) that improved agency rule-making; placed much needed emphasis on the fiscal impact of new rules by requiring a fiscal impact statement; and provided that the administrative law judge (ALJ) decision is the final agency decision in most contested cases – which leveled the playing field for citizens and businesses when disputing a state agency decision. This legislation streamlined the process for business interacting with regulators and requires state agencies to write in clear, unambiguous terms to reduce the costs of compliance. Leadership in this effort required constant negotiation between the coalition and General Assembly leadership throughout the legislative approval process. 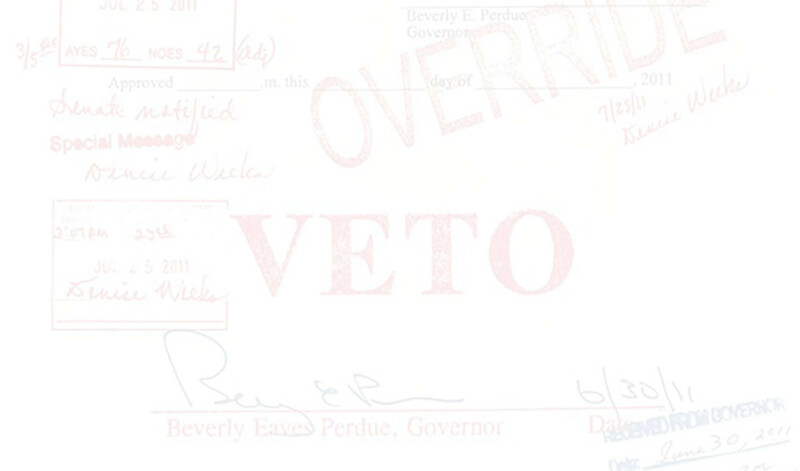 Then Governor Beverly Purdue vetoed the bill and the coalition moved quickly to engage more groups (including the State Employees Association) to help shore up votes for a veto override in both the Senate and the House. Success in this effort was a direct result of the trust built within the coalition itself and between our coalition and elected members.